HAWAI‘I FARM TO SCHOOL HUI. LEARNING GARDENS AND SCHOOL FOOD SYSTEMS. 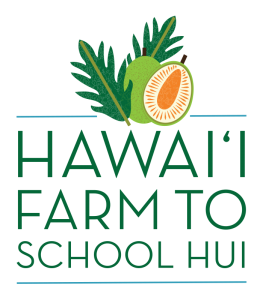 The Hawai‘i Farm to School Hui is a statewide network comprised of five island-level networks, community organizations, and representatives of the Hawai‘i departments of agriculture, education, health, and the University of Hawai‘i. The Hui formed in 2010 and became a program of the Hawai‘i Public Health Institute (HIPHI) in 2017. 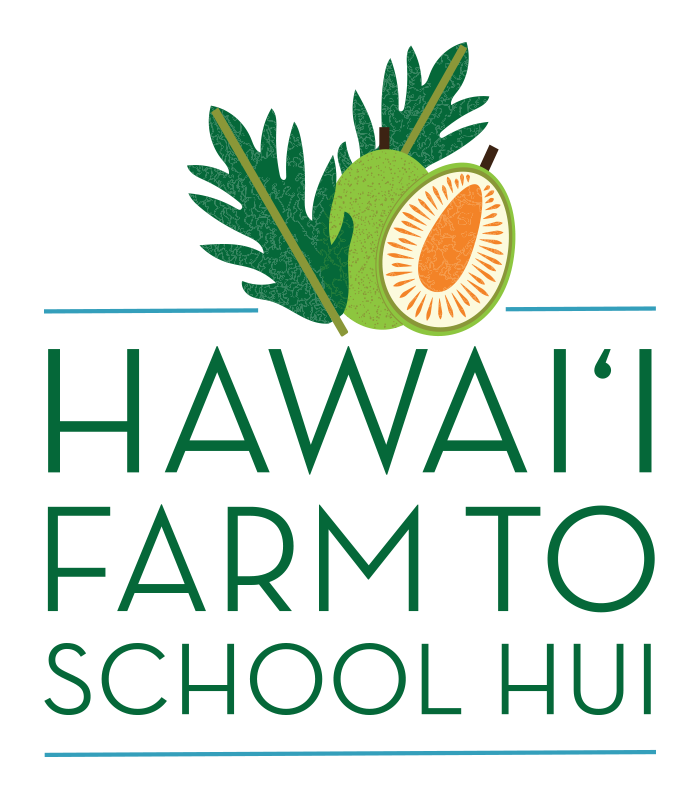 The Hui’s mission is to strengthen Hawaii’s statewide farm to school movement by supporting our island networks in the areas of capacity building, resource development and sharing, professional development, and policy development and advocacy. We envision a holistic education system that renews our relationship to food, farming, and the environment, improves health, and raises academic achievement. We envision Hawai‘i as a center for agro-ecological education and food production and as a model of regenerative community food systems for the Pacific and the world. Establish, support, and sustain school learning gardens and ‘āina-based education throughout the P-20 continuum. Increase access to, and consumption of, locally grown or raised food in schools and ECE settings. Strengthen the health of Hawaii’s people, ‘āina, and community food systems. 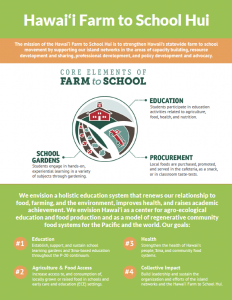 Build leadership and sustain the organization and efforts of the island networks and the Hawai‘i Farm to School Hui. Lesson plans adaptable for grades K-12 and designed to involve students as citizen scientists and partners in education and the prevention of rat lungworm disease (RLWD) in Hawai‘i. The Hawai’i Foodservice Hui Toolkit is a compilation of resources for independent school food authorities seeking to form partnerships for centralized nutrition program services and procurement. K-8 curriculum framework for standards-based learning in the garden, based on the question, “What do students need to know about good food, the environment, sustainability, and nature’s systems by eighth grade?” Includes Themes, Topics, Learning Outcomes, suggested Garden Activities and Classroom Extensions aligned with Common Core, Next Generation Science Standards, and Health Standards. 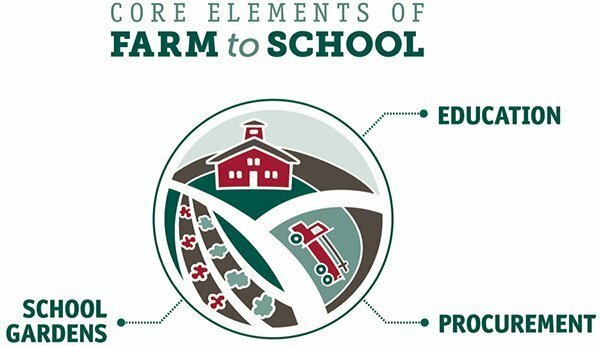 Studies show the positive impacts of farm to school programs in the areas of economic development, public health, community engagement, education, and the environment. As reported in the Benefits of Farm to School document published by the National Farm to School Network, the proven health-related benefits of farm to school programs include increases in fruit and vegetable consumption by students and demonstrated willingness to try new foods and healthier options. These benefits are especially evident when hands-on, food-based activities–such as school gardens and nutrition education–are offered in conjunction with healthier school food. Hawai‘i Farm to School Hui Members. Hawai‘i School Peace Gardens (HSPG) is a community of schools, support organizations, and state agencies dedicated to developing a culture of peace on campuses across Hawai‘i through the growth and integration of School Peace Gardens. 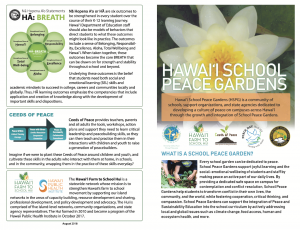 The foundational work of HSPG is based on the International Holistic Tourism Education Centre (IHTEC) and its International School Peace Gardens (ISPG) program, with a current emphasis on implementation of the Hawai‘i Department of Education’s Nā Hopena A‘o (HĀ) Framework and the Hawaii Peace Garden in the Schools and Community Project Framework. What is a School Peace Garden? REGISTER to become part of the HSPG community and request support if needed to develop your School Peace Garden.